With the new RS album coming out this summer, I wonder how many women there are who are wondering if it will include songs about them – either from actual encounters from long ago or from more recent imagined or misinterpreted interactions. Does Sylvia of long ago know there’s a song about her? Does “Jessie’s Girl” remember RS from her stained glass class and know that she inspired the Grammy-Award-winning song or was that class just a long-forgotten blip in her life that she never mentioned to anyone? Does the toxic muse who inspired the Shock/Denial/Anger/Acceptance album know she was the inspiration? When I first heard the SDAA album, I didn’t enjoy it at all. I had just read RS’s autobiography and listening to the songs just made me feel incredibly sad. Knowing that it represented such a painful time for him and thinking about his wife having to listen to those songs distracted me from enjoying the music. I especially like when I find out that a song was inspired by his wife because that is just so cool that she has brought out such inspiration in him for all these years. Anyway, just waiting for the new album to come out to hear the new songs. One new song – “Light This Party Up” was posted on his Facebook page, a short video from a Club Med concert. Another video – him playing part of his new song “Walking In” – was also on Facebook for a few days, but for some reason it disappeared from my news feed. I really liked that one and have found myself singing it often, although I’m not sure if I have all the lyrics right. Although I wasn’t able to go to the Club Med fan getaway, I got my fix, thanks to some thoughtful RS fans who have shared photos and videos on Facebook. Someone even posted a video of RS singing his new song. Whoo-hoo, thank you, thank you! For all there basking in the Florida sunlight and all the RS music, it looks like a wonderful time, have fun! Patiently waiting. OK, not so patiently. I want to hear the new songs NOW! And now that the Club Med Rickation is going on and there’s a chance he might play some of the new songs and I’m not there, it’s just kind of hard to focus on my weekday responsibilities. And the fact that he’s been talking about it having a country sound. What? That’s usually my least favorite music so I’m really curious about what kind of country he’s referring to. And it’s been a really, really long time since there was an album I was looking forward to. Since I was out of the loop for so many years, his recent few albums were available right away. My mom died 18 years ago today, at age 52, six weeks after a diagnosis of pancreatic cancer. The world has changed so much since then. It was before smartphones, texting, Facebook, YouTube, Twitter, 9/11. She never met my husband or my kids. She never knew that I’d become a professional writer, although she was one of my earliest supporters and encouragers in my writing, starting in third grade. Because she was usually the photographer, there are not many photographs of her. Because she was usually the one holding the movie camera, there are not many home videos of her. Because she always declined to speak into the microphone when my dad recorded cassette tapes of my sister and I when we were young, I can barely remember her voice. Yet despite the scarcity of photos, videos or recordings of her, something else still remains. An imprint that’s difficult to explain. On one hand, it’s the natural order of things. A new generation arrives as an older generation departs. But knowing that doesn’t make it any easier. The connections we make while together on this earth tie us together and it’s painful when they are torn apart. And while it may be beyond our understanding of why certain things happen when they do, perhaps there is some great explanation that will someday become apparent. We can keep those we love in our heart and pay tribute to them, by remembering them and by doing good deeds in their merit to keep their spirit alive. Meanwhile, all around us, the world goes on. 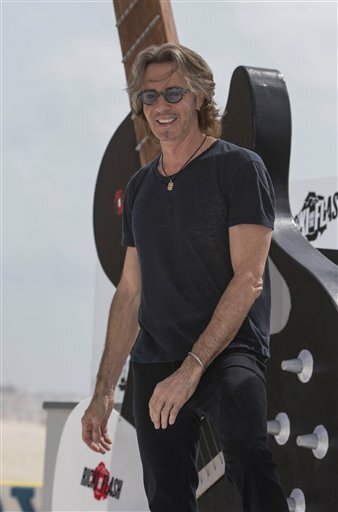 It would be lots of fun to write about how I’ve been busy this weekend packing for my trip to Port St. Lucie, Florida for my five-day all-inclusive fan getaway with Rick Springfield and Friends at Club Med. But nope, I can’t do that because I’m not going. Although it’s enough to blow my 13-year-old self’s mind that the opportunity even exists, it’s just not in the budget or the schedule at this time. But I can’t complain. I feel pretty fortunate that since I started this blog about eight months ago, I’ve seen his full-band show and his “Stripped Down” show and was able to meet him afterward both times. My 13-year-old self would have been pretty thrilled with that. (And my grown-up self is, too). As a condolence prize, though, in a couple of weeks – on Saturday, May 2, starting at 6 p.m. EST – Rowdy Ron is doing another one of his Saturday Night Springfield Special radio shows, where he plays hours and hours of RS music. Not quite the same as a five-day trip with RS, but appreciated nonetheless. Visit rowdyron.com to listen. To all who are going on the trip – have a wonderful time! 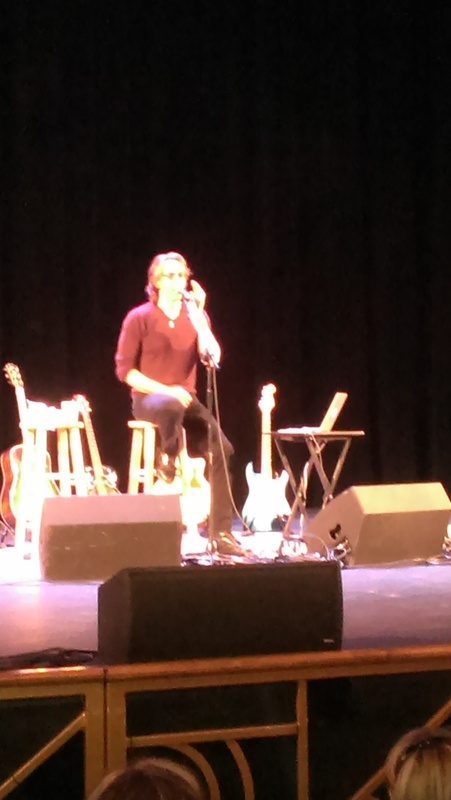 Rick Springfield answering questions from the audience during the recent Stripped Down show in Tucson. 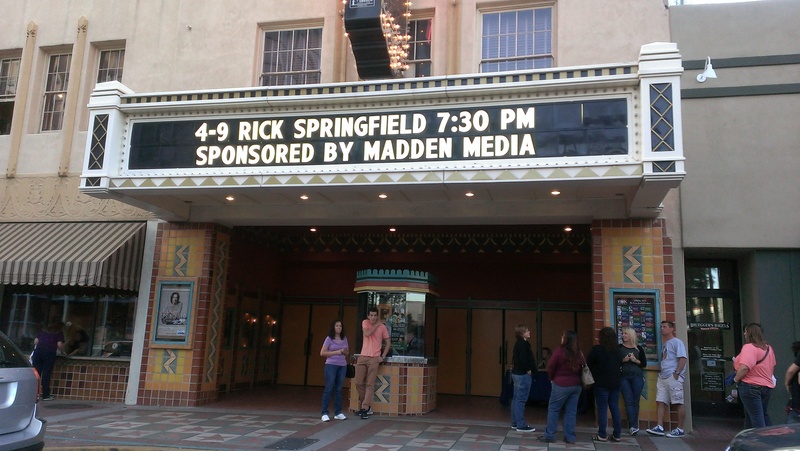 On Rick Springfield’s current Stripped Down tour, he returns to the stage after the show to answer questions from the audience. How cool is that? Before it starts, a moderator lays down the rules: Ask questions, but do not ask for an autograph or for a photo. It’s also not a time for statements, only questions. The rules sound reasonable but in the shows I have seen ( only one in person, the others online or on TV), people ignore them. And I don’t blame them, how many times does one get a chance to speak directly to RS? It has the potential to turn you into a babbling idiot (see previous post). Anyway, since there is limited time for questions after each show, I thought I would share some of the answers I have heard so we can get them out of the way and make time for new questions. Thankfully he addresses the question of “Was there really a Jessie’s Girl?” in the show so that one doesn’t need to be addressed. 1. General Hospital: No, he has no plans to go back on the show. He might consider it in the future if something came up but that was a long time ago and he is busy with lots of other things now. 2. What is his favorite dessert? Red wine. 3. What does he like to do when he’s not touring? Stay home with his family. 5. Will there be a sequel to “Magnificent Vibration”? He’s working on it. 6. When is his movie coming out? Aug. 7. 7. If you could tour with any current artist, who would it be? Paul McCartney. 1. Do you read Facebook posts and tweets from your fans? 2. Are you planning to write a follow-up to your autobiography? 3. If you could travel back in time, what would you say to your 17-year-old self? 4. Have you read the RSCrush blog? Wow! The Stripped Down show at the Fox Tucson Theatre last night was so great! It was a whole different experience than last month’s full-band show. Just Rick on the stage with his guitars and, for some songs, a “band in a box” (prerecorded musical accompaniment – both instruments and vocals – all done by him and saved on a laptop). The show really showcased his amazing talent, both musically and in connecting with his audience. He also addressed his recent hand surgery – he had a cyst that needed to be removed – and he said that his left pinky was numb so he wasn’t able to play guitar with it. When he told the story, female members of the audience responded with an “awwwwww,” which he joked about for the rest of the show, throwing in a “my pinky is numb” here and there, which received follow-up “awwwww”s. Despite his numb pinky, he still rocked! Perhaps it comes from his acting experience, but he’s really good at improvising. For instance, when a moth flew around him on stage, his reaction was hilarious. In addition to naming the moth – Mothy – he also shared that when he finds spiders in his house, he’s the type that puts it in a cup and brings it outside, which he said drives his wife crazy. “My Father’s Chair” was a huge highlight – such a powerful song, especially when he sang part of it without a mic and his voice still filled the room. As is the norm with the “Stripped Down” shows, he came back to the stage after the show for a Q and A. I stood in line although I hadn’t decided on a question yet. We ran out of time before it was my turn, which was OK. Right after the moderator said that people can only ask questions and it wasn’t a time to ask for autographs or for photos, the first person to speak said, “Hi, Rick. I don’t really have a question, but can you sign my book?” He also got “General Hospital” questions and “Do you remember this one show in 2001…” type of questions. Most people’s voices quivered a little bit as they asked their question or said their statement, which I can totally identify with. (More about that later.) He was so nice and gracious and funny in his responses. Anyway, it was a really incredible show and I felt really grateful that everything worked out the way it did so my husband and I could be there. I thought that since I met RS after the last concert, I could easily leave after this one, but that wasn’t the case. After all, we drove nearly two hours to get there and when would I get another chance to be in the same proximity as RS? After we started walking to the parking structure where we parked, I told my husband, “Let’s just go to the back of the theater.” He thought I was joking. I wasn’t. We walked around the block and some people were hanging around at the back of the theater. My husband wasn’t comfortable just standing there so I said, OK, let’s go get the car, come back here and park and try a little later. He’s probably doing the Meet and Greets now so it will take some time. (As if I’m an expert at this now). So on the way to the car, he still thought I was joking. I wasn’t. I said we’ll just hang out by the exit and see if he comes out. He told me it sounded kind of creepy and stalkerish. “Nah, he’s used to it,” I replied. So because my husband is awesome and knew how much this meant to me, he went along with it. But he didn’t want to park on the same side as the exit because he thought it was weird that we’d sit in a car waiting for RS. So we parked in front of the theater and walked around the corner. We sat on a bench where I could keep an eye on the fans already gathered at the exit and once they started walking toward the exit, I figured it was time so I grabbed my husband and we went over there. And sure enough, standing there was RS! He looked so much more well-rested than after the last show, probably because this was the first show in the tour instead of one toward the end after being sick for weeks. 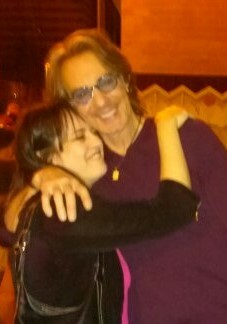 My RS hug picture, where I look either tipsy (I wasn’t) or like a nutcase (I don’t think I am). His people looked a little concerned that we were there (there were about 12 of us there), but they were nice about it, saying only that they were headed to get something to eat (it was about 10:30 p.m. at this point). So, being extremely gracious and kind, RS posed for a few photos – one with a whole group, one with one person and when it was my turn, I immediately turned into a babbling idiot. I said something like this: “When I met you last month, I didn’t get a chance to tell you, and I know this sounds crazy, but I wrote a blog about you.” He laughed a big laugh and gave me a big hug. My husband snapped a couple of photos and RS looked great but I looked either a little tipsy (although I didn’t drink anything but water) or like a complete nutcase. I’m not quite sure if the big laugh was because of the fact that I would write a blog about him or because he’d read it and thought it was funny but I prefer the second option (although that’s probably delusional). But RS, if you actually do read this: Thanks for being so kind, even to fans who come across as complete idiots. Hope you had a nice dinner and wishing you safe travels and a complete recovery for your hand. Thanks for putting together the Stripped Down show, it was really an incredible evening! Wow, wow, wow – so excited! We are going to tonight’s concert in Tucson! Thanks to a chain of events and awesome family members, my husband and I will go to the Stripped Down show tonight! My husband has been looking for a full-time job for a few months now so things have been tough and he found out this afternoon that he got one! He doesn’t start for a week or so but my dad lent us the money for the tickets and my mother-in-law will watch the kids. Does this make them enablers? Is this an addiction? Maybe. Perhaps the energy I was putting out in the universe about things coming together for me to be able to attend RS’s concert in Tucson tomorrow night wasn’t specific enough. But I did get to go to a cool concert tonight. Yesterday my dad called me to tell me that he had tickets to Barry Manilow’s “One Last Time” tour but his girlfriend was sick, would I want to go. Without hesitating, I said “Yes!” He’s a legend after all and I remember listening to his songs growing up. I was especially fond of “Copacabana,” and as a kid would sing it while dancing around in my living room. The concert was at the Gila River Arena in Glendale and our seats were as high up as you could possibly get. Literally. We were in the back row on the very top level, because my dad’s girlfriend prefers an aisle seat in the top row so she doesn’t have to climb up the stairs and can easily leave to use the bathroom. I didn’t care that we were so far away that the performers looked as small as little LEGO figurines though, I was there for the music and wasn’t even tempted to move forward to a closer row. (In contrast to the RS concert last month where my friend and I moved as close to the stage as we could.) Ushers handed out green glowsticks on the way to your seat, and people waved them during the concert in lieu of cigarette lighters. Mr. Manilow put on a wonderful show. He’s a talented songwriter and performer and it was a lot of fun hearing his songs live. He also did a duet with Judy Garland (from his new CD, “Dream Duets,” in which he used technology to record duets with his musical heroes) and there was also a video of him performing his first hit song, “Mandy,” in 1975 and then the current Barry joined the 1975 Barry in singing the song. There was also a sing-a-long to “Can’t Smile Without You,” with a smiley face dancing along the words on the screen. He talked a little about his life, how joining the orchestra in his school in Brooklyn changed his life. In 2008, he founded the Manilow Music Project to help musical programs in public schools and the project holds musical instrument drives in the cities he visits on his tour then the instruments are donated to local schools. I also learned that Manilow fans are known as “Fanilows” and he has many who have seen him many times throughout the years, such as RS has his loyal fans. For me, I was fine sitting in the last row just listening to the music and was ready to head home when it was over, but when I went to the RS concert last month, I needed to be as close as I could during the show and couldn’t leave without at least trying to meet him, even though when I did, I wasn’t able to say anything. There were probably lots of Fanilows tonight who feel the same way about Barry. At the RS concert, I could sing along to all the songs whether they were from 30 years ago or more recent ones and was happy to hear them all. Tonight, I was happy to hear songs I recognized, enjoyed some of the other ones and was excited to hear “Copacabana” because of the memories it brought. It’s funny to me that although I was totally excited to be at the RS concert, there were likely many there who enjoyed the songs, were thrilled to hear “Jessie’s Girl” and were fine with heading head home afterward without any desire to meet him. I would be willing to drive two hours to Tucson to see the Stripped Down concert, my husband is even willing to go with me AND my mother-in-law is in town so she could watch the kids. All that’s missing is the funds so I guess it’s not meant to be. So unless tickets magically appear tomorrow, it looks like it’s not happening. Waaaah.